Minimum quantity for "Lee Kum Kee Kung Pao Chicken Ready Sauce" is 1. Kung Pao Chicken is a classic dish in Sichuan cruisine, originationg from the sichuan Province in central-western China. 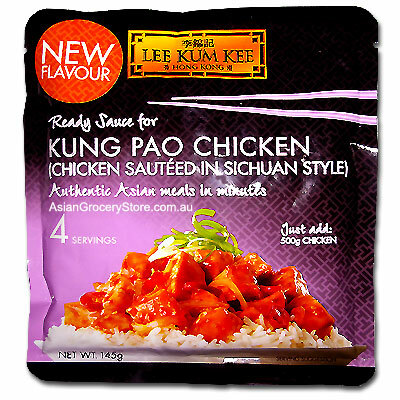 Now you can make tasty Kung Pao Chicken using Lee Kum Kee Ready sauce. Served with freshly steamed rice. Sugar, water, Soy Sauce (Water, Salt, Soybeans, Wheat flour), Garlic, Tomato Paste, Salted Chilli Peppers (Chilli Peppers, Salt), Honey, Yeast Extract (Teast Extract, Salt), Salt, Modified Corn Starch, Acidity Regulator (270), Stabilizer (415), Flavour Enhancer (631, 627).